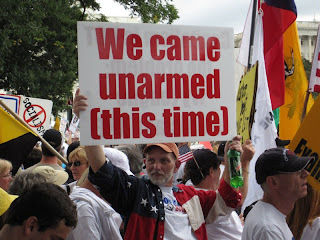 The Ostroy Report: Will Tea Party's Legacy Be in Splitting GOP Tickets Straight into Defeat? Will Tea Party's Legacy Be in Splitting GOP Tickets Straight into Defeat? Oh what a difference two years can make. Back in April '08, Florida Gov. Charlie Crist enjoyed sky-high approval ratings over 70% and was a serious candidate for Sen. John McCain's vice-presidential running mate. Along with Minnesota Gov. Tim Pawlenty and Louisiana Gov. Bobby Jindal, he was considered one of many rising stars of the Republican Party. Whether justified or not, they were packaged and marketed as moderates; Republican light. But they're all fairly hard-line conservative politicians. Yet to today's far-right-extremist Tea Party fringe, these guys might as well be Barney Frank. And that's great news for Democrats, who stand to benefit hugely as the misguided, small-minded passions of Tea Baggers serve to split GOP tickets across the country....thus sabotaging the party's chances of regaining power in November. Jump to April 2010, and Crist can't get himself arrested as he tries in vain to win the Senate seat vacated by Republican Mel Martinez and currently held by George LeMieux, his former aide and appointee. This week he announced he was defecting from the GOP and will run without party. Back in the Fall Crist held a huge lead over his Republican challenger, former Florida House Speaker Marco Rubio. Rubio went from trailing 22 points to leading by 18. The Democrat in the race, U.S. Congressman Kendrick B. Meek, is running third. Rubio is a Tea Party favorite. So is Crist's defeat a Tea Party victory? Hardly. What we're seeing in various national campaigns is a foreshadowing of the Republican Party's ruination. The party has been hijacked by Tea Bag radicals; super-duper hardline right-wing fanatics who comprise the absolute smallest wing of the party yet have the loudest voice. They've handed over the reins to rabble-rousing propagandists like Sarah Palin, Michelle Bachmann, Glenn Beck and Newt Gingrich, and in the process effectively kicked out pols who now do appear moderate/centrist by comparison. As former Democratic National Committee Chairman Howard Dean asked this week, "Is this a sign that people, perhaps centrists or moderates, like Charlie Crist, have no place in this new emerging Republican Party?" The answer is yes. And that will be the GOP's final death knell. Consider what former President Ronald Reagan said after he defected to the GOP: "I didn’t leave the Democrat Party, it left me." That's exactly what's been happening to the more moderate conservatives across the nation as the Tea Baggers have ratcheted up their racist, homophobic, xenophobic, anti-government radical attack rhetoric. And Crist is not alone in his defection. Arlen Specter switched parties last year after realizing he could no longer win as a Republican. To be sure, the Tea Party is making political life very difficult for candidates who would've been shoo-ins prior to this movement's controversial emergence last year. Over in Utah, Bob Bennett faces an extremely tough primary race even though he's conservative enough to have earned an A grade from the National Rifle Association, an 84% rating from the American Conservative Union and 98% from the Chamber of Commerce. In Arizona, Sen. John McCain is seriously threatened by primary challenger J.D. Hayworth, watching his once sizable lead shrink to around 5 points. For Indiana's Senate seat being vacated by Evan Bayh, former Senator Dan Coats is facing a stiff challenge from state Sen. Marlin Stutzman, who's got far-right backing and support. In Kentucky, Rand Paul (son of Ron) is the Tea Baggers' favorite, yet it is Trey Grayson who has the support of party leaders. There are similar stories elsewhere such as California, Colorado and of course the swing state of Florida. In a year when Democrats are supposed to be shaking in their boots over the GOP Bogeyman's big gains in November that'll sweep them back into power, it is the Tea Party that Democrats may be thanking a few months from now for pouring scolding water on the Republican "revolution." " Over in Utah, Bob Bennett faces an extremely tough primary race even though he's conservative enough to have earned an A grade from the National Rifle Association, an 84% rating from the American Conservative Union, and 98% from the Chamber of Commerce. " You don't examine that very closely. A 98% score from the Chamber of Commerce means 'lacky for corporate special interests at our expense'. Ron Paul, in comparison, scored dead last in the Chamber of Commerce's ranking. You have a very skewed idea of what motivates the tea parties. I would agree with your premise that the Tea Baggers are a net benefit to the Democrats => IF <= the Democrats had been doing things which clearly benefit those of us whose fortunes reside on Main Street. However, too many "reforms" have been pushed out of the Congress which only make life more difficult for We, the People. Obama and the Democrats are their own worst political enemies. It's like they have become the DC version of the Keystone Kops, only Mack Sennett isn't around to ensure that somehow a happy ending ensues. How have they failed us? Let me recount the ways. I could try beating the dead horse known as health insurance profit reform, but I'm sure everyone is tired of that rant. So I'll try something else. For instance, what surprises have you found in your statements from your credit card issuers? Has your interest rate shot up? Are you now expected to pay fees that didn't exist just six months ago? Are you paying interest first with what balance remaining going toward your principle? And what is this about Obama's comments regarding how "liberal" justices made some poor choices back in the '60s and '70s? Just whose side is he on anyway? Do civil liberties and legal protections from a police state mean nothing to him? Then there is offshore drilling. The disaster looming in the Gulf will drip all over Obama's Oval Office desk, making it less likely that he will be putting his feet up there any time soon. Add in the expanded terror wars against terror, the increasing number of bombings in Pakistan, Guantanamo remaining open, foreclosures increasing again, employment remaining limp at best, etc., etc., etc., ad nauseum, and one has to ask just what the Democrats have done to earn my vote. In what should be the beginnings of a major electoral rout, Obama is leading the Democrats to a close decision. They can still win as long as the Tea Party doesn't gain more strength, but it won't be by much. They could also still lose if the GOP somehow figures out how to negate what little beneficial that the Democrats have accomplished (see: larger tax refunds for many of us who aren't in the top 1%). Electoral victory isn't a sure shot done deal, and it isn't going to be as long as Obama doesn't change his strategy. Obama's legacy is one of a leader who refuses to lead. This Novemeber's election is going to demonstrate to the world just how little effectiveness he has shown. The electoral result due to his incompetence will affect how America is seen by the rest of the world, and could result in a struggle among the world's nations to determine who becomes top dog to take our place. Kumbayah isn't going to be the theme song of the contest. I don't know where the previous posters saw their "Tea Party" people. Here in upstate NY they rolled through Syracuse. The Ron Paul people were pretty pissed that Republicans have coopted their issue with their astroturf organization. They feel the movement is not legitamate at all, at least the Ron Paul supporters I know and have talked to. The Tea baggers should bring their guns down to the Gulf and scare the heck out of that oil slick. Sarah Palin, how's that "Drilly baby, Drilly" thing for ya? Ron Paul wants to do away with Social Security. I am in my 50s and have seen my retirement IRA & 401K tank. I have worked my whole life. I will not support anyone who wants to do away with SS. Out of work Baby Boomers that can are starting to take their SS at 62. Think about it. Do we really want old folks to be set to poor houses like happened before SS? Why don't folks know their history???? If only angy white folks vote in November we all lose. I am white and hope the selfish racist homophobic wbite folks don't win. I find them a total embarrassment. If progressives vote or those who see the danger of tea baggers vote, we should be okay. We will lose some seats, but that is traditionally how it goes in the midterms. Wake up folks!